Heatmaps have recently been launched, powered by our charting technology Highcharts. Heatmaps are two-dimensional and show correlations between two variables. Adding a heatmap is really simple. 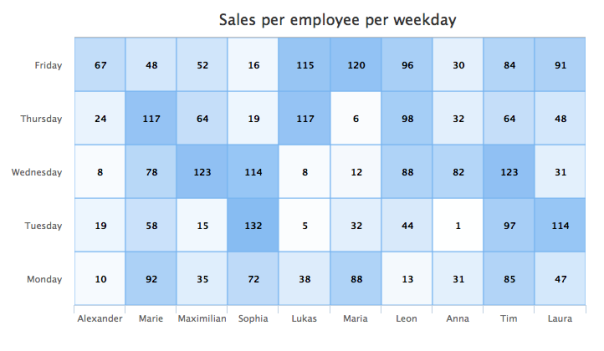 Create a new chart as normal, (in brief: open a tile and click the chart button at the bottom left of the screen) but instead of just adding one grouping, add two. Add your calculation (e.g. count or records) as normal too. Update: agileBase now supports global mapping based on any address that Google will recognise. Postcodes are still the quickest way to map UK data.